February 27, 2019 (Toronto, ON) – Mere weeks before dropping his debut EP, Teenage Fever (out March 15), singer songwriter Johnny Orlando brings his latest single “Sleep” to life with a dreamy video co-starring actress Nadia Turner. Premiering on YouTube on February 27 at 6 p.m. EST, fans are invited to tune-in to catch the video at http://johnnyorlando.lnk.to/SMV. 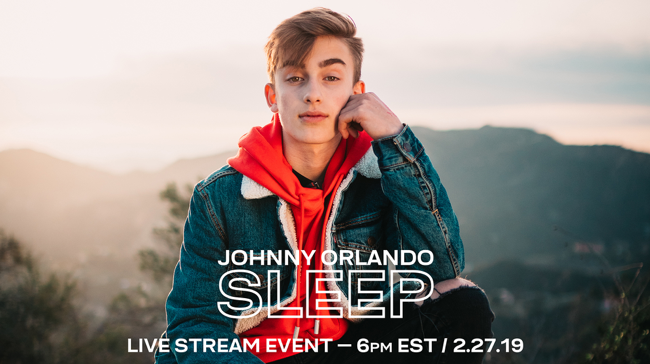 Following the video premiere, Johnny will treat viewers to a special acoustic performance, followed by a fan Q&A led by his sister Lauren Orlando, all streamed live with from the YouTube Space in Toronto, ON. Directed by Justin Schaefers with creative direction by Andy Slater and shot in Los Angeles, the video perfectly captures the song. Co-written by Orlando, his sister Darian and Swedish collaborators Linnea Södahl (Zara Larsson, Anne-Marie) and Hampus Lindvall (Zara Larsson), ‘Sleep’ is the second single from Johnny’s upcoming debut EP. The pop Swedish-influenced song about living in the moment and not wanting that moment to end showcases Johnny’s maturing sound and songwriting skills. Set to share his first solid musical statement with his debut EP, followed by a headlining North American tour this spring, the recent JUNO-Award nominee for Breakthrough Artist of the Year has more surprises to share with fans in the coming weeks.